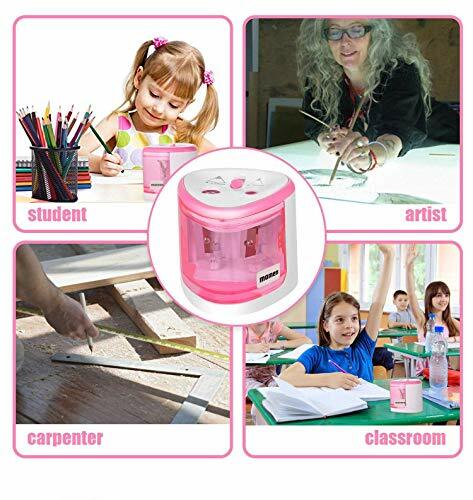 DOUBLE HOLE DESIGN: The Electric Pencil Sharpener is Good for regular and painting pencil. 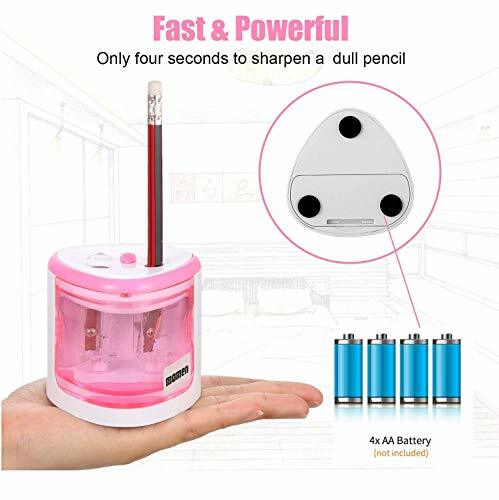 Featuring two separate holes for different pencil diameters: 6-8 mm and 9-12mm: professional desktop design with powerful motor featuring two separate holes for different pencil diameters.The pencil sharpener equiped with 2 replaceble cutters. 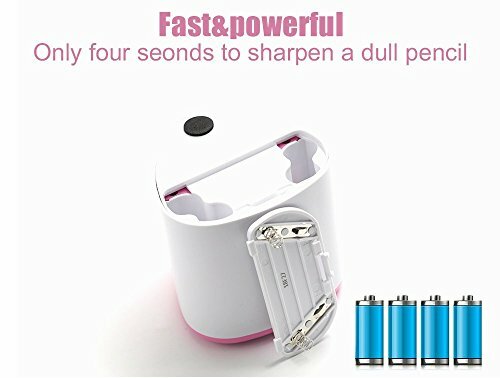 FAST WORK AND SAVE TIME: The battery operated pencil sharpener heavy duty features a high-quality helical steel cutter which is good enough to produce a well-sharpened point. Ultra-durable high- grade stainless steel helical blade it takes only 3 seconds to sharpen, giving you a stunning shave experience. 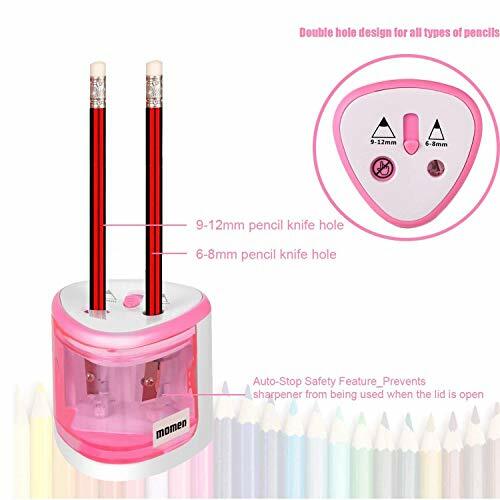 SAFETY FOR YOUR KIDS: The Automatic pencil sharpener is that it comes with one sliding protection switch can hide the shaving entrance, avoiding your kids to push their fingers in. It won't operate if the cover is removed or is not installed correctly. That means no risk for your fingers when you are using it, which makes it an ideal choice for classrooms with young kids. 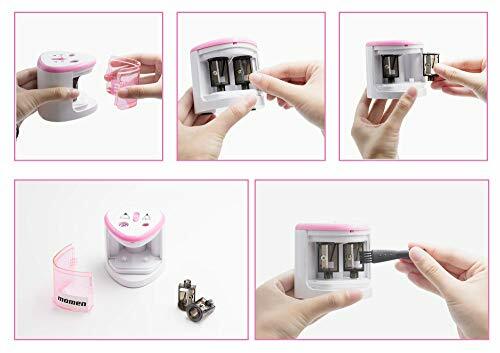 EASY TO CLEAN AND CARRY: Removable blades is convenient for you to take blades apart from sharpener and clean it up. And we have equipped you with a cleaning brush, easily brush away the hidden pencil shavings and it would keep newly always. Great for commercial use, classroom, executive use. 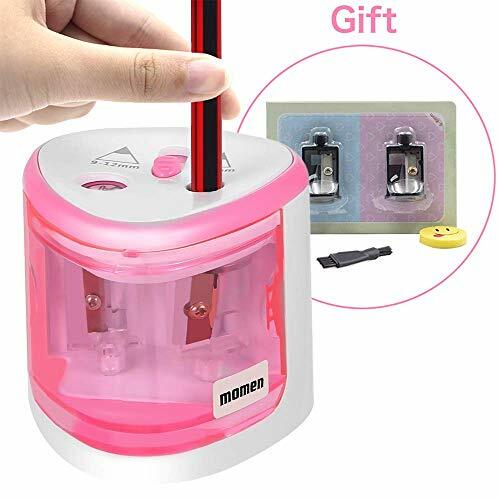 100% SATISFACTION GUARANTEED: We always support 360 days full refund or replace for any product issue, if anything wrong with the pencil sharpener, please don't hesitate to contact us. We will provide satisfied solution to you!